^ Wilma, David. Okanogan County — Thumbnail History. HistoryLink.org. 2006年1月21日. ^ United States Census Bureau. 2010 Census Data. United States Census Bureau. [7 May 2012]. ^ Wayne S. Moen. Conconully Mining District of Okanogan County, Washington (pdf). Washington State Department of Natural Resources. [2012-04-20]. 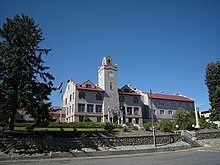 ^ Washington State Archives – Central Regional Branch: Guide to Holdings: Okanogan County. [2007-12-31]. ^ Bright, William. Native American placenames of the United States. University of Oklahoma Press. 2004: 346 [16 September 2011]. ISBN 978-0-8061-3598-4. ^ 11.0 11.1 Resident Population Data: Population Change. United States Census Bureau. 2010-12-23 [2010-12-23]. （原始内容存档于2010-12-25）.